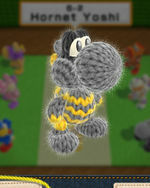 Music Yarn Yoshi Takes Shape! 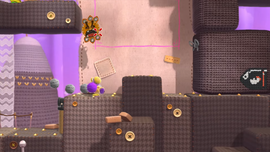 Snag-Stitch Mountain is the second level of World 6 in Yoshi's Woolly World. The level begins with a Shy Guy and a Snag-Stitch. A few Bullet Bills appear, along with more Snag-Stitches and a vertical climb leading to the first checkpoint. More Shy Guys and Bullet Bills appear, as well as a few Woozy Guys. Several more Bullet Bills appear, as well as more Snag-Stitches, just before the second checkpoint. A Bullet Bill Patch will appear, as well as even more Snag-Stitches, leading to a long vertical climb with yet even more Snag-Stitches and Bullet Bills. After the vertical climb, there are additional Bullet Bills as well as the Goal Ring. Smiley Flower 1: When reaching the second Snag-Stitch, Yoshi must immobilize it on the left, eat the edible wall, then flutter jump onto a Bullet Bill to get the Smiley Flower. Smiley Flower 2: Inside a secret alcove just to the right of the topmost Snag-Stitch at the vertical climb just before the first checkpoint. Smiley Flower 3: Immediately after the second Wonder Wool, there is a warp pipe outline that Yoshi must fill in and enter. Inside the secret room, Yoshi must hit the Winged Cloud on the right to reveal the Smiley Flower, then throw another yarn ball at it to collect it. Smiley Flower 4: Just after the first Bullet Bill Patch, Yoshi must head up and to the right, and immobilize three Snag-Stitches to reach an alcove with the Smiley Flower. Smiley Flower 5: Behind the second Bullet Bill Patch. Wonder Wool 1: Near the end of the Umbrella Yoshi segment, stuck between two Flippers. Yoshi must follow the wind current up and to the left to enter from above. Wonder Wool 2: In a hidden Winged Cloud on a platform at the top right of the second Woozy Guy. Wonder Wool 3: Just above the group of Snag-Stitches just before the second checkpoint. Wonder Wool 4: In a hidden Winged Cloud above two Bullet Bill Blasters in the area to the right of the area with the fourth Smiley Flower. Wonder Wool 5: Just above the goal roulette. Yoshi must jump on a Bullet Bill to get it. Collecting all of the Wonder Wools knits Hornet Yoshi back together. A Transformation Door can be found by filling in a warp pipe outline just above the third Snag-Stitch and entering. It turns Yoshi into Umbrella Yoshi. This page was last edited on December 10, 2018, at 07:28.